Discover Griffin Ranch Homes for Sale in La Quinta, CA. Offering the ultimate in gracious desert living, the exclusive, 24-hour guard-gated community of Griffin Ranch was once owned by television personality Merv Griffin. In 2008, Lennar Homes took over Griffin Ranch and in 2014, an additional 221 luxury homes were added. Homeowners enjoy a vast array of world-class amenities from luxurious, open-concept homes offering uncompromising quality and detail to the exquisite Griffin Club, reminiscent of an age-old European villa, state of the art tennis facilities, and so much more. 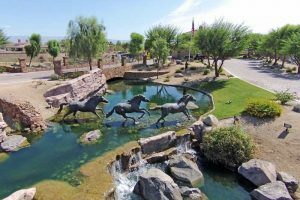 Griffin Ranch is located in gorgeous South La Quinta near the upscale communities of the Hideaway, Madison Club, and PGA West. Whether you are interested in a full-time residence or a secondary home, you are certain to find Griffin Ranch real estate that will fit your lifestyle and needs. Homebuyers can select from luxurious new or resale homes offering a distinctive array of architectural styles including Spanish, Tuscan, and Mexican Modern. Griffin Ranch features sprawling ranch-style homes that include wrap-around back verandas, gourmet kitchens, open courtyards and guest casitas in select floor plans. Homes range in size from 2,900 Sq.ft to 4,882 Sq.ft. Elegant upgrades and stylish features that are typically considered options in most other communities come standard in the Encore Collection and the Prestige Collection of new home designs available at Griffin Ranch. Featuring luxury and livability, the Encore Collection offers an array of floor plans, ranging from 3,271 to 3,818 square feet. Homes come with 4 bedrooms, 41/2 bathrooms, and 2-3 car garages. Home designs offer upscale features and details that include luxurious master suites, wine rooms (optional), private guest casitas, spacious outdoor living areas, and come equipped with smart home products for a touch connected home. Featuring luxurious living at its finest, the Prestige Collection offers spacious home designs ranging in size from 4,154 to 4,820 square feet. Homes come with 4 bedrooms, 41/2 bathrooms, and 2 to 3- car garages. These stunning homes feature open layouts throughout common areas along with dual master suites, private guest casitas, and living suites, formal dining rooms, and optional game rooms and wine rooms. Nothing short of “grand” can describe the Griffin Club, featuring a lounge with a bar that opens to an inviting outdoor space with fireplaces, a convention room that seats 200 people, and a catering kitchen for large and small events. Members also enjoy a state-of-the-art fitness center and Pilates room, a junior Olympic-size swimming pool with outdoor café and splash park for the kids, and world-class tennis facilities including a sunken court with stadium seating and shaded lounging areas. Golf enthusiasts can work on perfecting their short game on the putting green, and dog owners can walk their canine friends while socializing in the security-gated dog park. Known as “The Gem of the Desert,” La Quinta boasts endless sunshine, the majestic Santa Rosa Mountains, quaint cafes, fine restaurants, name-brand retailers, one-of-a-kind boutiques, and so much more. Old Town La Quinta offers a unique desert shopping and dining experience as well as live music, and outdoor art festivals. If you love golf, you’ll definitely fall in love with La Quinta. Recognized by Robb Report as “The Best Place to Live for Golf,” La Quinta has over 25 top-rated golf courses to pick from. Residents also have access to miles of scenic biking and hiking trails nearby. Polo fields and one of largest professional tennis stadiums in the world are just minutes away from Griffin Ranch and the world-class amenities of Palm Springs and Palm Springs International Airport are within easy driving distance. Griffin Ranch homes for sale La Quinta are part of the highly-regarded Desert Sands Unified School District. A lot goes into buying or selling a home and Elaine Stewart understands that no one person, no matter how experienced or knowledgeable, can provide the best service without a team of specialists. Offering over 24 years of local real estate experience, Elaine provides the skills, dedication, and personalized service that her clients deserve. Whether you are looking to invest in one of the beautiful Griffin Ranch homes for sale in La Quinta or thinking about selling your current home, experience matters most in a changing market. For sellers, your agent should know how to act swiftly and decisively to get you the highest price. Elaine will get your home SOLD and will get you the best market price in the least amount of time possible. For buyers, Elaine is always the first to know when new inventory becomes available, ensuring that you have immediate access to the best homes and securing an offer. She will be there to protect your interests and advocate for you and will work hard to ensure a smooth and successful transaction. Elaine would love to speak with you to discuss the type of home you are looking for and to see if Griffin Ranch homes for sale in La Quinta are the best match for your individual needs and lifestyle. Please give award-winning La Quinta REALTOR® – Elaine Stewart a call today at 760-668-2399 or fill out the online contact form and she will be more than happy to answer any questions you may have.